Republican vice presidential nominee Paul Ryan made it clear last night that he and Mitt Romney believe that they can win the White House by telling lies, over and over again. During his GOP convention speech, Ryan lied repeatedly and deceived the public proudly. We counted at least nine major falsehoods and outright deceptions — statements that can be easily debunked by the news media. But Ryan and Romney have made it clear that they don’t care. They had to know that mainstream journalists would point out the deceit in Ryan’s speech — and it has been happening since last night. And because they had to know what the news media would do (even Fox News has called Ryan's speech "deceiving"), it seems clear that they’ve made what may be an unprecedented political calculation: that it won’t matter if the news media points out their lies and deceptions because many voters no longer pay attention to the news. It wasn’t that long ago when politicians were afraid of being caught in a lie. They knew that if they lied, then journalists would point it out and voters wouldn’t vote for them. It was a simple system: Lie, get caught, lose the next election. But Ryan proved definitively last night that he and Romney believe this system is no longer operative. He and Romney have obviously concluded that there is no political penalty for lying anymore, because the news media has become irrelevant. “We're not going to let our campaign be dictated by fact checkers,” Romney pollster Neil Newhouse boasted to reporters recently. Indeed, Ryan and Romney have launched a new political strategy for winning the White House that reflects their belief that fact checking is irrelevant. Their plan is to lie, lie, lie, and then lie some more. They’ll tell lies in television speeches, and then reinforce them over and over again in a barrage of TV ads. They’re betting that voters are more likely to pay attention to political ads during their favorite primetime TV shows — from American Idol to Dancing with the Stars — than to news reports. And they're strategy might just work — thanks to the decline of the news media over the past two decades and the reluctance by mainstream news reporters to call a lie a lie, coupled with Citizens United and the rise of so-called dark money political groups. Romney and Ryan also are positioned perfectly for this new strategy — they’re swimming in political campaign cash and they’re backed by deep-pocketed Super PACS and dark money groups funded by big corporations. As a result, they’ll be able to flood the airwaves with lies and deceptions — as they are already doing in swing states — this fall. And they’re betting that many American voters will only hear their lies, and so for these voters, the lies will be the truth. 1. Ryan claimed that President Obama “took” $716 billion from Medicare to fund Obamacare and that he and Romney will “protect” Medicare. Obama did not “take” any funds from Medicare. He achieved savings from the program by lowering future reimbursement rates to medical providers, like doctors and hospitals. People on Medicare today and in the future will not be affected by the cuts. Ryan also failed to acknowledge that his own budget plan envisions a similar $700 billion savings from Medicare. He also proposes to privatize Medicare, and replace it with a voucher system in which seniors will have to use vouchers to buy private health insurance. Romney and Ryan are repeating the Medicare lies in TV ads. 2. Ryan again criticized the Obama stimulus package last night, but didn’t acknowledge that he lobbied the Obama administration for stimulus funds for his own Congressional district. 3. Ryan blamed Obama for the closure of a GM plant in Ryan’s district in Wisconsin, but Ryan knows that the plant closed during the Bush administration. 4. 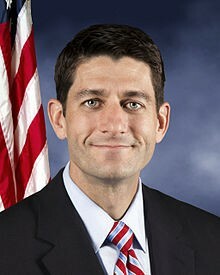 Ryan also criticized Obama for the auto bailout without acknowledging that he also voted for the auto bailout. He also didn’t acknowledge that the auto bailout saved the US auto industry. 5. Ryan blamed the credit downgrade of the US government on Obama, when S&P stated it was in part because of the federal government had not raised taxes — tax increases that Ryan and his fellow GOP representatives have steadfastly refused to vote for. 6. Ryan criticized Obama for not embracing the recommendations of the bipartisan Simpson-Bowles debt commission. Ryan, however, did not acknowledge that he was a member of that commission and voted against its recommendations. 7. Ryan criticized Obama for not balancing the federal budget, but did not acknowledge that his own budget plan doesn’t envision a balanced budget for at least twenty years. 8. He repeated the lie that Obama said in a speech that small business owners did not “build” their own businesses. Obama said that business owners throughout the country are helped by the fact that government builds roads that the businesses and their employees use and operates schools that educate future workers. 9. In a TV ad barrage, Romney and Ryan say Obama eliminated the work requirements in welfare. The president did not; he allowed states to relax the requirements, but only if they could show that more welfare recipients in their states were actually getting jobs.